Throughout her career as a software engineer, Neha Jain has understood that learning by doing is more relevant to programming than theoretical exams. 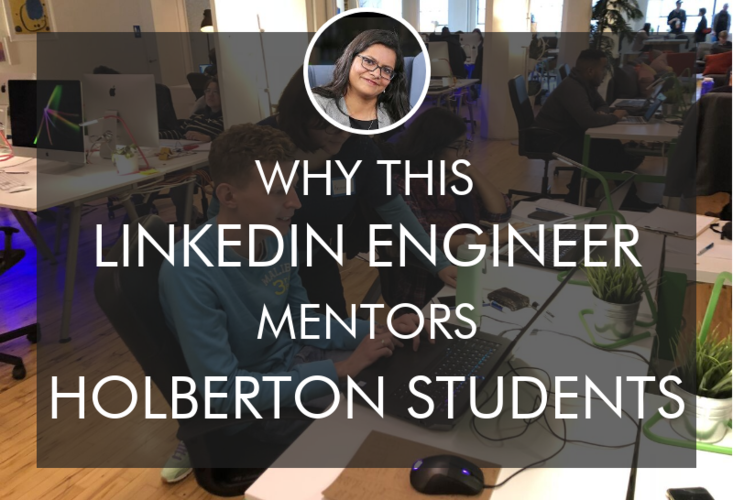 Now an engineer at LinkedIn (and a recipient of the CloudNow Women in Cloud Innovation award), Neha is passing her wisdom onto the next generation of engineers at Holberton School. We get Neha’s thoughts on the impact of non-traditional education, the quality of engineers graduating from Holberton, and hear her advice for bootcampers who want to excel as developers in the industry. First, tell us how you got involved with Holberton School. Holberton School was founded by one of my friends and previous SlideShare coworker, Sylvain Kalache. He talked to me about the idea for Holberton School when it was in the early phases, before their first cohort. When Sylvain asked me to be a mentor, I was completely surprised. I thought, "I'm just a Software Engineer; why do you think that I'd have anything to offer?" He assured me that there were students all over the ladder; they still had a lot to learn and they would want to know how I got to where I am today. Even though I want to grow a lot as an engineer, I’ve realized that I can still teach and mentor other people to get to my level. The school was within walking distance from the SlideShare San Francisco office, so I walked over one evening and all the students were so excited to meet me – especially the women. They told me I was the first female mentor they had met; they asked me a lot of questions and I came out of that first meeting feeling very energetic and excited. 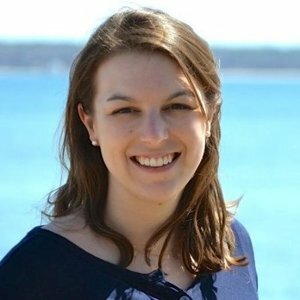 So Holberton actually gave you the opportunity to realize your role as a mentor – cool! When you are working at a company like LinkedIn, especially in software engineering, there are always smarter people than you. So you feel that imposter syndrome all the time. Mentoring at Holberton and working with a group of students was a very nice break from all those feelings. Were you at all skeptical about coding bootcamps when you first started mentoring with Holberton? Actually, I thought it was a pretty good idea. When I studied IT in India, we had great professors, but the exams and material taught were all theoretical. Theory can only teach you so much; programming is very practical. You have to write code and build projects to learn – so I did a lot of side projects. I was also accepted to Google Summer of Code, which is a three month, global program that brings more student developers into open source software development. I learned a lot from my mentor during that 12-week program. In my experience, I knew that learning and doing go hand-in-hand, so when Sylvain proposed the idea of Holberton School, and mentioned that the school would be project-based, I thought, "Oh, yeah. This makes so much sense." Do you think that Holberton is teaching students what they need to know in order to be legit engineers? When I started working in the industry, I realized that I had to unlearn some things I had learned in college. I had to learn interpersonal dynamic collaboration, soft skills, and timelines, which are so important. There are just so many things that college doesn't teach you about working in the industry. Because Holberton has a two-year long learning model, students are learning everything they need to be immediately productive in a company. It’s a project-based school, divided into front end, back end, database, and security – and students rotate to get exposure to all the areas involved in a project. It seems like a natural way to learn how to be instantly productive in your software engineering job in a company. There are no traditional “instructors” at Holberton School, so what does it mean to be a Holberton School mentor? The way Holberton sets up their mentorship program is actually very interesting. It's not a traditional structure where they ask for a 9am to 5pm time commitment; instead, it's more on a requirement basis. I've worked with three different batches of mentees – so we don’t work with the same students all the time. I’ve given presentations and talks on Regular Expressions and I prepared a project for the students. As a mentor, I also helped with the curriculum; C is a big component in the Holberton curriculum, and during the first year of Holberton, we all contributed to the new curriculum in a Google Doc. The tech industry is something that is changing every day. So you have to learn by reading, and by trying new things by yourself. The entire philosophy of the school is that students learn by themselves and learn by doing. So Holberton students don't get traditional mentors or traditional instructors. They get the material, read the material, they learn, and they ask questions on the Slack channel and in person to mentors. At LinkedIn, have you hired from Holberton School? We actually have hired a couple of Holberton School students. LinkedIn started a program called REACH last year, which is an apprentice program that brings people from nontraditional backgrounds into engineering. The goal of REACH is to recruit fresh, talented people who have a passion for computer science and programming, and then for six months, we will treat them like regular software engineers. We give them the same challenges and tasks as a normal engineer, and if everything aligns, then they get a full-time offer. Justin Marsh, a student from Holberton, got hired into the Reach program when he was only five months into Holberton. Now he’s a full-time software engineer at LinkedIn. He is not on my team so I don't work with him directly, but I've heard a lot of good things about him. As a successful engineer, what is your advice to bootcampers who want to be true contributors to the engineering community? What do students need to do after they graduate from a school like Holberton? Have an open mind, be curious and always be willing to learn new things: those are the keys to being a successful engineer on a team. If you have an open mind, you’ll learn to not make any assumptions about the intentions of your teammates. You’ll make the right call in difficult situations because you will not be emotionally attached to your ideas, or your work. If you ask the right questions, you will end up making informed decisions and helping your team, because of that, you’ll become a really productive team member. You should always be curious, not just about technology but also about the business goals and the culture of the company. And obviously, you have to always be learning because there are always new tools coming out. Technology is one area where trends change faster than the blink of an eye. You have a lot of experience in AI and machine learning. Do you think these are required subjects for a new developer these days? I wouldn’t say developers ‘should’ know these subjects, but great developers are generally curious people. For example, at LinkedIn, back end developers were doing machine learning and a lot of the front end developers were curious about it. They asked their managers how they could be involved and understand what goes into machine learning. So the machine learning experts on the team set up a bootcamp at the company to teach others. There was so much interest around it, even from people not using machine learning full-time. I think that's how it should be – whenever there are new, exciting technologies, developers will be inclined to learn more. Do you see AI putting coders out of jobs? That one is a little bit tricky. The media sensationalizes AI in the tech industry a lot, and I often hear that AI will be putting engineers out of jobs, but I don’t see that happening, at least for the next 10-20 years. Artificial intelligence is being used to enhance our lives, jobs, and the things we work on – it informs our decisions. It's more like an added advantage that frees up a lot of resources from doing redundant tasks that can be automated. In addition to Holberton School, you’re also building a community for mothers in tech – could you explain the goal of PiMothers? When I moved to the U.S. three years ago, my husband and I didn't have any extended family or friends. We were working and building relationships from scratch. I saw that the culture in the United States is so different from India – people cherish their independence, as opposed to in India, which has a very close-knit culture. I was curious how mothers are so exceptional at their work and also exceptional as parents in the US – how do they balance everything? I did some interviews and thought that this information might be useful to other women in technology, so I thought I should share it with the community. First I checked with the women who I had talked to and shared a draft of the post with them. I published it, only upon their consent. My husband actually helped me design the logo, which was very cool. With PiMothers I want to build a community of women that could help each other out. Now I don’t set up interviews with anyone, rather I have created an automated process with an online form to allow women to share their stories from their comfort zone. Why is it important for you to be involved with mentoring the next generation of engineers at Holberton? I’ve learned that mentorship is just in my nature. It gives me a sense of purpose in life. Even at LinkedIn, we have a bootcamp program to train new hires, and I enjoy mentoring those new college grads as well. Also, the founders of Holberton School are really accomplished software engineers. They are smart people so their students are in good hands. Read more Holberton School Reviews and be sure to check out the Holberton School website!